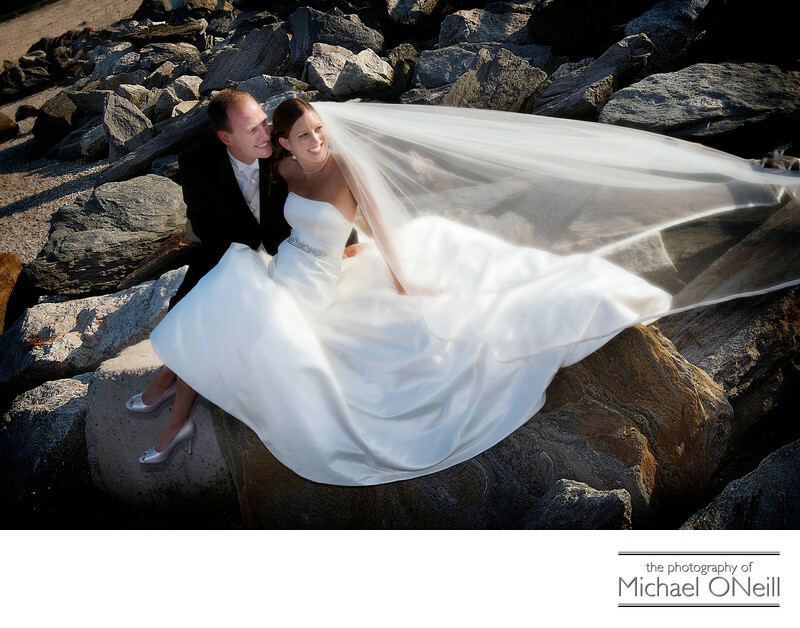 Another great wedding photograph from the Long Island Waterfront...this one taken on the jetty at water’s edge on Cedar Beach in Mt. Sinai, New York. I remember this wedding like it was yesterday. Jennifer and David were one of the most fun-loving couples I’ve ever had the pleasure of working with and their bridal party, the bridesmaids and groomsmen, were an absolute joy to work with. They wanted fun wedding pictures and that is exactly what they got. Hitting the beach a sort while before sunset we took pictures of the bridal party running along the beach, climbing up on the jetty and posed along the fishing pier. Elsewhere on this web site you will see other awesome pictures taken of this couple and their friends at this beach location, as well as at their wedding reception venue, The Hamlet Willow Creek. I still have a complete wedding day sample of this event on display in my studio as a custom leather bound bridal album. I invite you to come take a look at it and consider using my services if you’re looking for some really fun wedding pictures on your big day.